BOONE, Iowa — AGCO Corporation (NYSE:AGCO), a worldwide manufacturer and distributor of agricultural equipment, debuted the Massey Ferguson® RB Series Silage Baler during the 2018 Farm Progress Show in Boone, Iowa, August 28 – 30. The RB Series Silage Baler is a tough, heavy-duty choice for producers baling corn stover and it is ideal for small dairy operations and small- to mid-sized cow-calf operations who want to bale high-moisture forages as a feed source for their livestock. The RB Series Silage Baler is the first silage-specific baler to be offered by Massey Ferguson and produces high-quality, high-density silage and corn stover bales. This heavy-duty premium baler is engineered to deliver the throughput and reliability required for the demanding job of making bales from heavy, high-moisture crops and dry, course material such as corn stover or wheat straw. The cam-less pickup needs no cam track, so there are fewer moving parts, which makes the pickup quieter, less sensitive to wear and more reliable. It also means less maintenance and fewer adjustments to save operators time and increase productivity in the field. The pickup has an 84-inch tine-to-tine pickup width and a five-tine heavy-duty bar design that ensures clean pick-up of heavier wet forages and smooth intake into the bale chamber. Long, heavy-duty tines feature a large coil for added flexibility that reduces the chance of tines breaking when picking up heavy crop. Several features of the RB Series baler design ensure the uniform, well-shaped bales that optimize baling, transporting and storage efficiency. The compact pick-up is positioned close to the rotor, ensuring smooth, consistent crop flow into the bale chamber, well-shaped uniform bales and increased baling output. These variable-chamber balers feature the Constant Pressure System (CPS), which increases the pressure as the surface of the bale grows, so density stays consistent through the entire baling process. Four continuous belts, made of multiple layers of rubber and synthetic material, have great tensile strength for a firm grip on the crop and significant pressure on the bale. The belts are manufactured with substantial overlap rather than joined with a seam, for less potential for belt breakage and downtime. The bale chamber has two rollers above the feed system and large CPS springs help the belts flex, allowing a quick start but ensuring that plenty of pressure is put on the crop right from the beginning as the core of the bale is formed. A crop press roller helps the pick-up feed in smaller volume crops, ensuring efficient flow and improving bale shape. It also levels out large quantities of crop to prevent lumps. Both models are equipped with the exclusive HydroFlex Control two-stage anti-plugging protection system that minimizes downtime. The automatic mechanical floor can flex downward underneath the rotor so that a rock or crop bunch can pass through. In addition, the hydraulically controlled floor can be lowered by the operator from the cab, to clear crop from the chamber before a plug occurs. The RB series silage balers also feature the Xtracut™ 17 with two sets of hydraulically operated knife banks giving operators the option of not chopping or having 8, 9 or 17 knives engaged, allowing for smaller cuts and adjustable cutting lengths up to 2.65 inches. The Xtracut 17 also is controlled from the cab, for quick adjustment so operators can cut the forage to best match crop conditions and animal feed requirements. Varionet™ wrapping ensures the net wrap is applied evenly across a bale and wraps ‘over the edge’. Bales not only look good but are protected against harsh weather and feed-quality losses. The easy load system (ELS) carries two spare rolls on the baler, so roll replacement can be done in a matter of minutes. 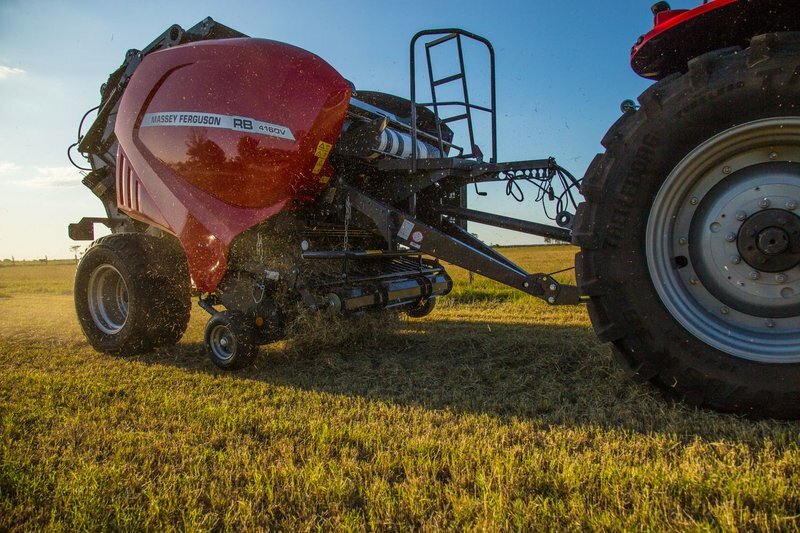 To learn more about the Massey Ferguson’s new RB Series Silage Baler and which one will fit your operation, contact your local Massey Ferguson dealer or visit masseyferguson.us. Click here, to discover more new equipment releases.